When discussing the management of opiate dependence and addiction, everything is individualized since there is no one treatment that fits all. Each patient would have to be evaluated thoroughly including co-occurring medical and psychiatric disorders to better treat the baseline problem that led each patient to seek and like the drug of choice. Patient’s commitment, compliance, perseverance and understanding of the medical condition is a good prescription towards recovery. The road towards recovery will be confronted with multiple hurdles/obstacles challenging the patient that temptations are present. You think of these temptations as vaccination pit stops to boost your resistance against relapse. Staying focused in treatment will create a solid mental preparedness against the opioid monster. This article explores Conventional vs Rapid Opiate Detox methods, and the relative benefits of each approach. The treatment for opiate dependence starts with detoxification. Here are some points to consider when seeking the opioid detoxification process. This type of treatment would include inpatient detoxification of opiates at facilities that provide intensive psychotherapy on a daily basis for an extended period of time, that could range from days to weeks, depending on each case. These patients would have to spend time away from family, loved ones and work. Co-pays for insurance and deductibles will add up for such treatment. Consider lost income from being away from work. That is one aspect of this treatment. The second point is the type of medication used to detoxify the opiate in use. The standard for opioid detoxification protocols at these facilities is the use of MAT(medication assisted treatment) consisting of Buprenorphine products marketed as Suboxone, Zubsolv and Bunavail. Buprenorphine is a partial agonist to the opioid MU receptor. With this treatment, patients are given Buprenorphine to replace their opiate of choice. Buprenorphine is an opiate will therefore satisfy the need of the opioid dependent receptors. So Buprenorphine cannot be stopped as it will cause severe withdrawals. Some patients might benefit from this treatment. A third point is that some patients would stop the Buprenorphine products and go back and forth to their opiate of choice. Also some patients use Buprenorphine as a crutch when their drug of choice is not available. With conventional treatment, the opioid receptor still needs the opiates, whether Buprenorphine or any other opioid. 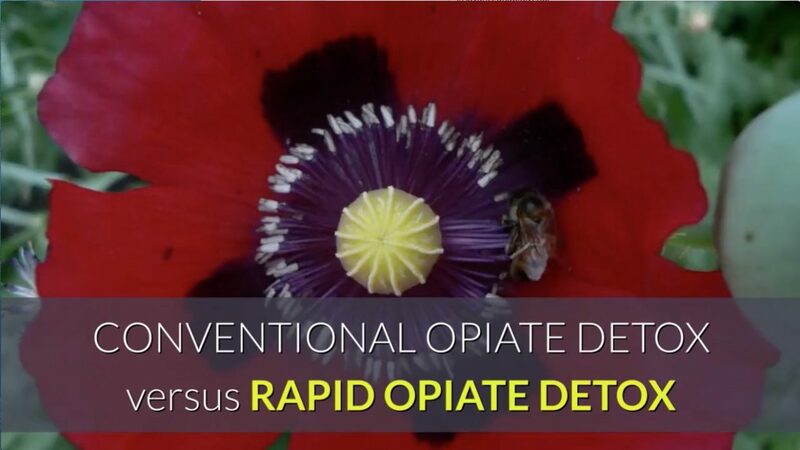 There are only a few centers in the united states that do rapid opiate detox under sedation. Rapid detox is a type of treatment for motivated patients who want to be clean of any and all opiates. The rapid detox entails sedating the patient to bypass the withdrawals, flushing the opiates out of the brain opioid receptor and blocking it with Naltrexone to reduce cravings. It is the humane way to detox. I would classify this type of opiate detoxification treatment as an abstinence model, meaning the opioid receptor would be completely free of opiates after being detoxified. In other words, the patient would be totally opiate free since there is no substitution of one opiate for the other. To stay abstinent, we highly recommend the use of the opiate blocker, Nlatrexone. The continued use of Naltrexone for 1-2 years will allow healing of the neuro-circuitry of the damaged brain. Rapid detox is not covered by any insurance. Patients pay out of pocket. The average patient stay is only 3-4 days to complete the rapid opiate detox treatment. Short stay, pain-free withdrawals, no drop-outs and higher success rate, are just some of the advantages of rapid detoxification under sedation.